The Vol. 4, No. 13 issue of The Pride cover stories address the run off race for AS President, and ongoing threats to cultural diversity efforts from forces outside of the campus community. 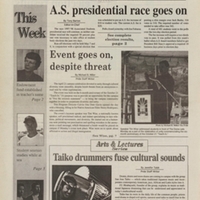 April 24, 1997,” University Archives at the CSUSM Library, accessed April 20, 2019, https://archives.csusm.edu/student-newspapers/record/126.